Baltimore City’s 8th Councilmanic District was created following the passage of a 2002 referendum which reshaped the council from six three-member districts to fourteen single-member districts. The boundaries of the 8th District are Liberty Heights Avenue–Hilton Parkway–Wilkins Avenue–Baltimore City/County Line. 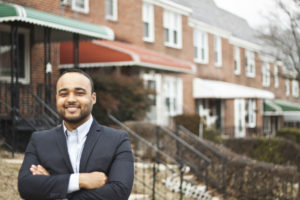 Kristerfer Burnett, a lifelong Baltimorean, lives in the Edmondson Village community where he and his wife, Vanessa, are third-generation homeowners. He was educated through both the Baltimore City and County public school systems. He is a graduate of the University of Maryland-College Park where he earned a Bachelor’s Degree in African-American Studies with a concentration in Public Policy. He then earned a Masters Degree in Public Policy at the University of Maryland Baltimore County. Kristerfer’s journey into community organizing began at a young age as he watched as his grandmother organize her neighbors in effort to save their neighborhood from the expansion of Johns Hopkins Hospital in East Baltimore. He carried those lessons with him as an undergraduate, serving as a founding member of the student-led social justice advocacy organization, Community Roots. As a graduate student, Kristerfer concentrated his studies on issues of affordable housing policy, urban development and improving K-12 academic outcomes in low-income communities. During that period, he was also selected to serve as the Public Policy Student Senator for the UMBC Graduate Student Association and as a graduate research assistant at the Maryland Department of Health and Mental Hygiene. Immediately after earning his Master’s Degree, Kristerfer was hired as community organizer for the Service Employee International Union (SEIU1199) “Good Jobs, Better Baltimore” campaign. The campaign, a coalition of unions, churches, and community groups, pushed for livable wages, corporate accountability, and increased investment in our communities. He was featured in the 2014 Baltimore Social Innovation Journal for his work doing leadership development workshops for community leaders through the Neighbors Without Borders of Greater Southwest Baltimore, organization he founded in his community. With the goal of unifying Southwest Baltimore neighborhoods, Kristerfer organized several town hall meetings–all of which where resident-led and focused on gathering the community’s vision for their neighborhoods. This resulted in the creation of the Community Roots Leadership Development Academy where residents are trained on being change agents for their communities; and the Edmondson Village Farmers’ Market at Edmondson-Westside High School. He was also honored by the Daily Record as being one of the “20 in Their Twenties “for his work as a community organizer in Baltimore City. He truly believes that the most fulfilling aspects of his life have been giving back to those who need it and empowering the residents of Baltimore to be change makers. Kristerfer will continue to remain an advocate for social justice and support others to make an impact on the city of Baltimore.